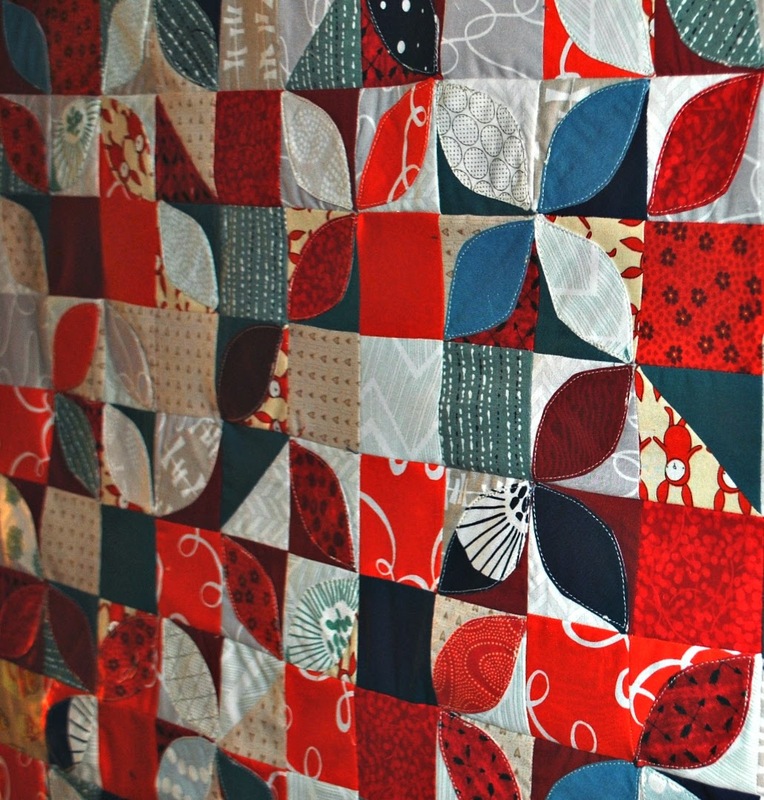 I finally had time to work on my Orange Peel quilt along quilt top over the weekend. Entries close on September 8th so I was really pushing the dead line here. Last time I talked to you about my quilt top I was feeling less than thrilled with the layout. 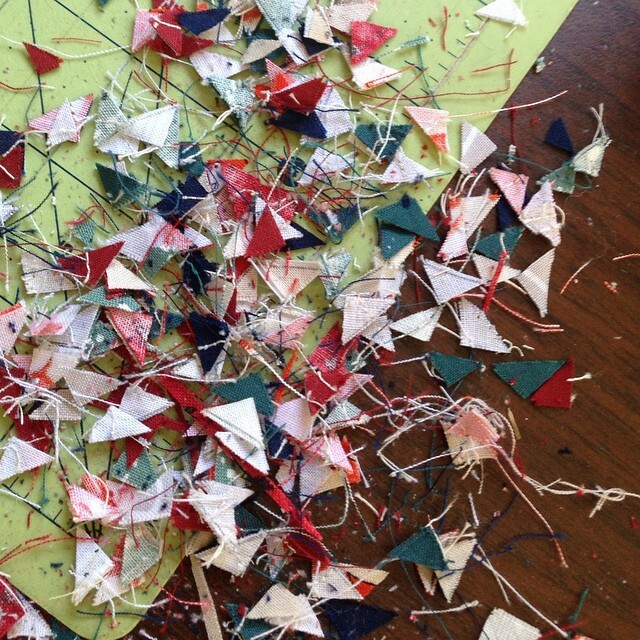 Piecing was not going smoothly and I really had fallen out of love with the design. But after finishing up my center block for the Round Trip Quilts round robin bee I pulled the blocks out again and just started sewing them together, first into sets of two, then into blocks of four, and strips of eight, then rows of seven... and along the way, I managed to fall in love again. If I was to make this quilt again, I'd definitely do some things differently. My HST were much smaller than I originally intended. A math mistake led to 2.5" HST instead of the 5" I had intended to make. I skipped trimming my HST (which was dumb) and it made the piecing that much more difficult. My orange peels lost their crisp points and are a little blunted. 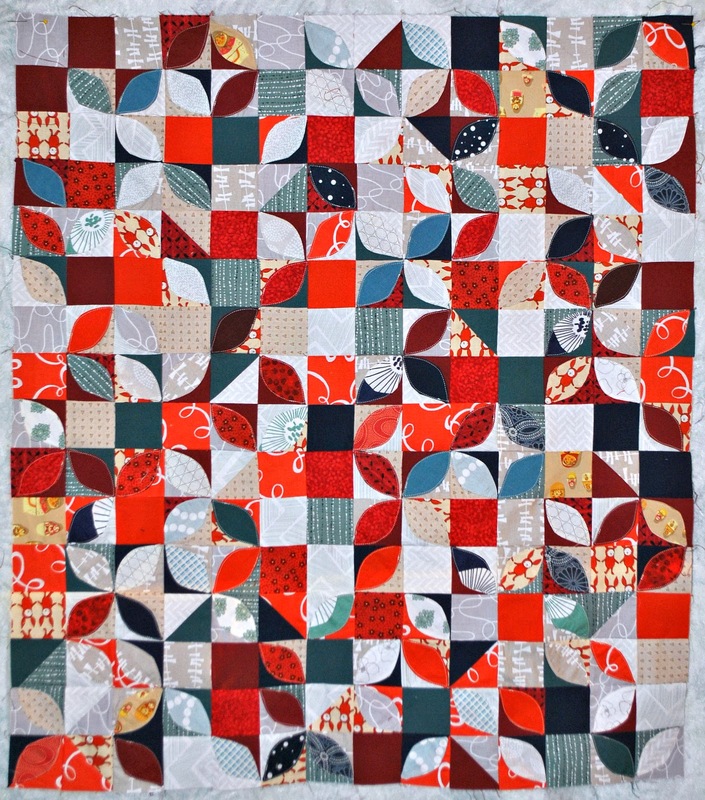 I'd concentrate the peels more to the center of the quilt and show more completed orange peel segments instead of laying them all over the top. As it is, I think there's only one or two places where the four points all converge to form the traditional orange peel design. But c'est la vie. That's Life. I like what I made but it's a little different from what I imagined when I started. I added a thin 3" border in solid white to frame the orange peel top, then bordered the whole thing with some Cotton + Steel Netorious in Cloud Silver. This warm grey off sets the saturated orange peel center nicely I think. I think I have a plan for quilting... I'm picturing phantom orange peels quilted on the empty blocks and HSTs. Maybe this will help with the idea that I think there should be more concentrated orange peels on the top. I've already picked out a backing fabric. It's some extra yardage I got on super sale earlier this year. Not sure what it is. I was a little short so I decided to use up the rest of my favorite bunny print and add some aqua stripes to get the size where I needed it. I've really had a love-hate relationship with this top. I was so excited about the concept when I started sketching designs and piecing the blocks. Then when I actually got to piecing the quilt top, I hated how it looked. As I said earlier, I am finally at the point where I can appreciate it and enjoy this quilt but it's really been touch and go... That's why I am calling this quilt Hot+Cold. I hope to snap some better photos of this quilt soon so stay tuned for more. Once the weather cools down I can get to some quilting! It looks good. It's like leaves falling on the grass. Leaves are not always were you expect them to be. And their points are not always sharp. I'm glad you meet the deadline. 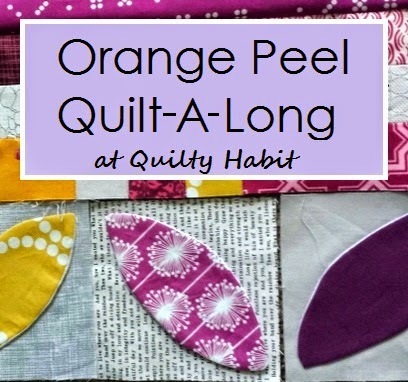 I love the idea of quilting phantom orange peels. I think this looks great! I like it! I looks good set into that wide border. I was also following the QAL -- I'm actually using that Netorious in Cloud Silver for all the background of the orange peels. But I won't finish it in time since my machine had to go into the shop for a couple weeks. I am glad you got past quilting 'hump day' and are starting to like it again. I know that feeling and have quilts that were almost never finished because they were not turnig out as I thought. Sometimes the new plan is better than I thought. It looks fabulous from here. The colours really pop! I think this quilt looks great. I love the colours and I love how you bordered it. I too am guilty of not trimming blocks much to my later detriment. Will we ever learn? I think that your quilting plan sounds great! I am so glad you stuck with it and I hope you stay in love with it as you finish. Awesome!! I know how you feel, when your feelings towards a project change. I love the risks you took and the bold colors! Your color combo looks really good! Lovely version! I like your idea for quilting it. It's all a process, sometimes things work out better than you plan, other times a little worse. Let's hope this one comes around for you after you quilt it!